Do you love Minecraft but wish you were able to build a wider variety of contraptions with the elements the game provides you? If so, IndustrialCraft is for you. IndustrialCraft is an unofficial Minecraft mod that inserts dozens of new items and recipes into the game and vastly expands its potential for fun. The answer is in the mod’s title. 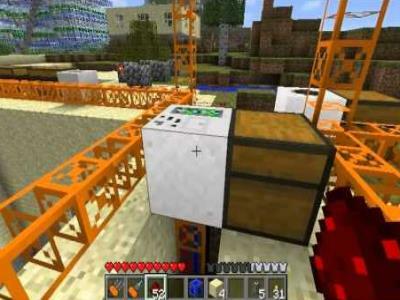 IndustrialCraft introduces many new types of machines, most of which are powered by electricity, a brand new feature that has not been implemented in vanilla Minecraft. Some of IndustrialCraft’s new gadgets are merely more efficient versions of existing objects, such as the Iron Furnace. Others are completely original. The Jetpack and Electric Jetpack are equippable items that allow you to fly through the air, and the new Teleporters can transport you across long distances instantaneously, letting you skip the time-consuming task of building railroads. These new electronic marvels are powered by batteries that can be recharged in the Generator, another new electricity-producing object that also provides machines with direct power in the form of Energy Units. Of course, to craft these amazing new items, you’ll have to build them using many of the new elements that the IndustrialCraft mod provides. You can now mine copper and tin ore and mix them in an alloy to create bronze tools. You can also build electric versions of the hoe and the all-new wrench that are powered by batteries and won’t wear out with use. The adventurous Minecraft player can even build a Nuclear Reactor and power it with refined uranium ore. Just make sure to watch out for meltdowns! Minecraft is a game with endless potential, and IndustrialCraft takes advantage of that potential to create an almost entirely new game that’s even more fun than the original.